Implementing partners and stakeholders gathered at CARDI’s office in Central Farm to celebrate the achievements of the first phase of the Regional Coconut Industry Development Project. 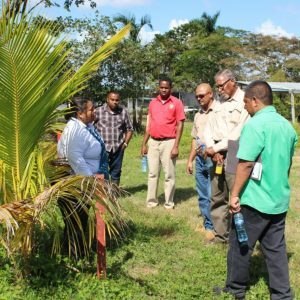 Following an overview of the project’s activities and achievements by CARDI Representative, Omaira Avila Rostant participants received a tour of the upgraded Central Farm coconut nursery. This together with two other nurseries in Yo Creek and Dangriga were expanded and upgraded with a collective capacity of producing over 55,000 seedlings annually. Participants also saw some of the practical ways they can care for and manage their nurseries and plantations to achieve good yields. One of the highlights of the project in Belize was the hybridization programme which has had a positive impact on the availability of hybrids for farmers. Participants were able to get a first hand view of this process. Over the four years and through the national stakeholder platform, several small scale agri processors and entrepreneurs have received training and assistance to develop their coconut value added products and by products. At the CARDI Day celebrations these participants got the opportunity to showcase these products. According to Avila Rostant this was particularly pleasing as persons with an interest in getting into coconut processing will be inspired to do so. Some of the processors on hand were Ellis’ Coconut Oil, Bella Dees, Tp’s Coconut Water and Flo Natural Coconut Water. Texbel Farms a member of the national stakeholder platform and one of the largest producers of bottled coconut water and fruit juices in Belize, also joined in the celebrations.